What does the coming four Blood Red Moons of Bible prophecy have to do with current events in America and the Middle East? In a special End Times Praise show on the TBN Praise the Lord TV show Jonathan Cahn, bestselling author of the Harbinger and Bill Salus, author of Psalm 83, The Missing Prophecy Revealed explain the possible connections. 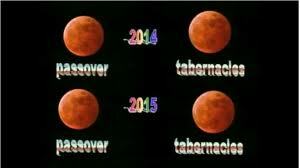 Four Blood Red Moons are coming on the Jewish feast of Passover 2014 and 2015 and on the feast of Tabernacles in 2014 and 2015. Blood Red Moons occurred in 1492, 1948, and 1967 on Jewish feast days. These past occurrences resulted in something big happening to the Jewish people, and to some degree America. For instance America was discovered in 1492 when the Jews were being persecuted in Spain. Watch this fascinating TV show and find out what the upcoming Blood Red Moons in 2014 and 2015 might be signaling in the heavens that is about happen upon the earth. Bill Salus also discusses the Bible prophecies that predict the destructive judgments that are forthcoming to Damascus and Syria.